For the next in our ongoing series taking a sneak peek ‘behind the scenes’, we are excited to bring you this interview with Erica Davis, a stylist, fashion journalist, brand consultant, and the creative force behind the award-nominated blog, The Edited. Erica Davies, has over fifteen years experience as Fashion Director on national newspapers and magazines. She’s travelled around the world on shoots, styled books, appeared as a style expert on TV and radio and even created her own collections for high street fashion chains. Her blog The Edited is her take on style, shopping and more, it’s a beautifully curated look at her ever so stylish world. Thank you so much for sharing some of your insights with us Erica! When did you start your blog ‘The Edited’? I started my blog in 2012, just before I had my second child. 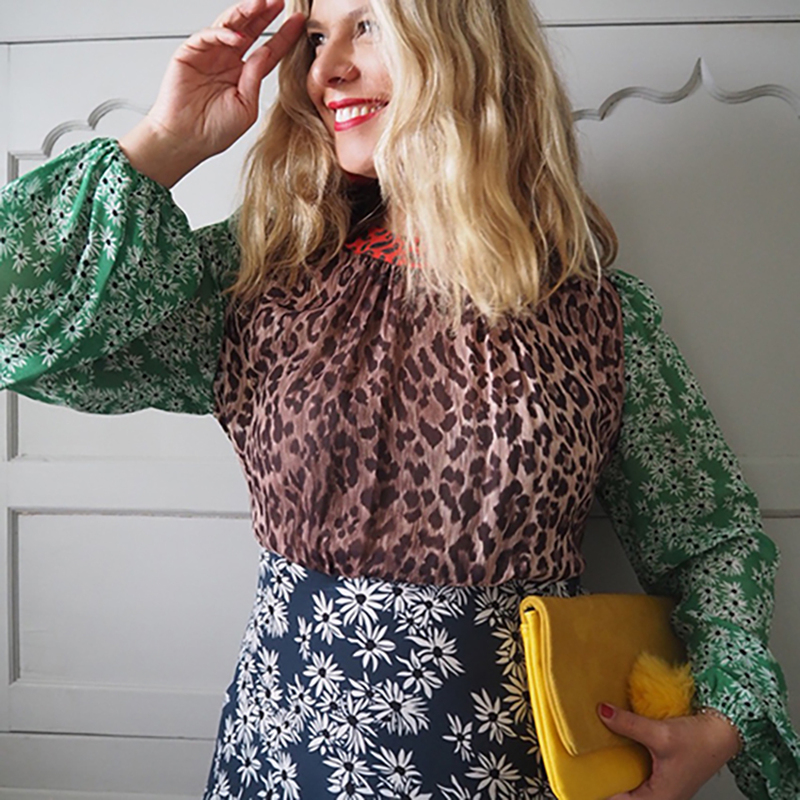 I wanted something that would fulfil me creatively during my second maternity leave – and I wanted to share things I loved, from fashion to décor. Have you always been interested in interiors as well as fashion and if not when did you first become interested? Yes, it has always been an absolute passion. My mum loves it too and we used to spend hours looking for wallpapers and fabrics when I was a child. I remember pouring over the Laura Ashley catalogue when I was tiny, imagining how I would have my own home one day! Describe your home, where is it, who lives there, how long have you lived there? We moved from a traditional Victorian house in South East London to a fairly new-build, Georgian style house on the border between Essex and Suffolk just over a year ago. It was the space, flexibility and potential that sold it to me. I live here with my husband James, and our children Charlie, 6 and Lila, 4. I’m fairly eclectic – I love mixing old with new. 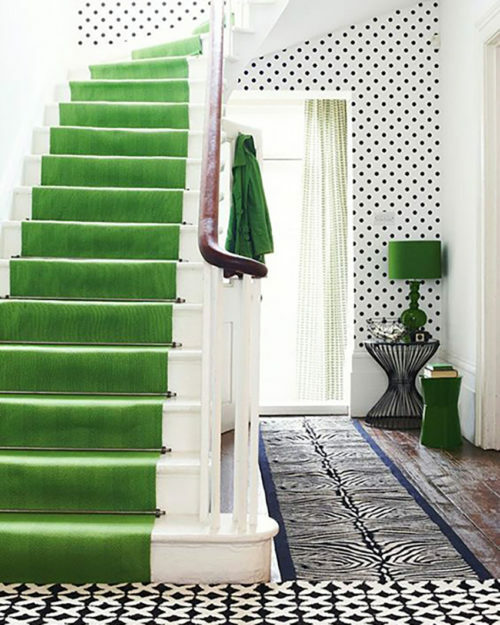 I love colour and pattern and am not afraid of using them in a scheme, but I always want it to be sophisticated. 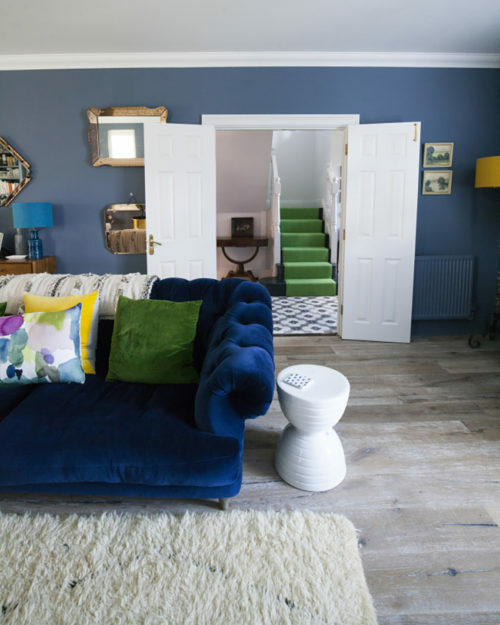 My vision for this house is fun and colour – I want the kids to grow up and be inspired by their environment! Where do you find your lifestyle inspiration ? I am a huge fan of Instagram and Pinterest and could spend hours on both. Favourite designer – fashion or interiors? Fashion, I love the ladylike designs of Emilia Wickstead and interiors, the quirky cool of Kelly Wearstler. Who makes all the decorating decisions in your house? Me! My husband very much leaves it up to me! Our living room because it’s the first one we tackled and I love sitting in it at various times throughout the day. The light in there is so pretty. How long have you owned a Roger Oates runner? 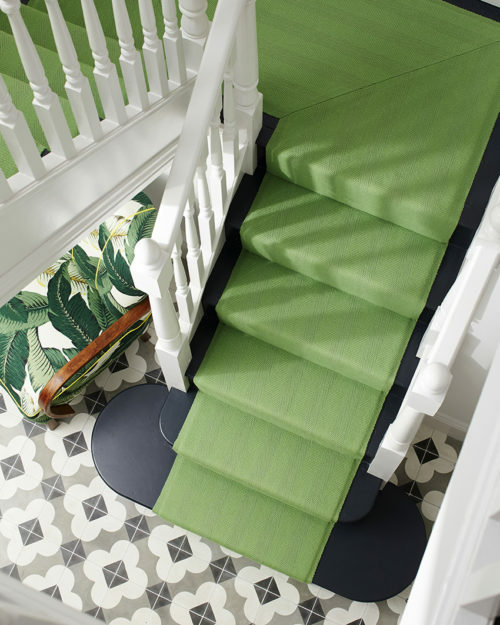 Why did you choose a Roger Oates Design runner? Was the New Hadley Lime an immediate choice or did you deliberate between a few designs? The lime was an immediate choice. I had spotted an image on Pinterest which really inspired me and I was determined from that moment on to go for it. It actually inspired the colours I will use throughout the house. What’s the best compliment you have had about your runner? That it has inspired people to be bolder with their colour choices! If you enjoy having a peek behind the scenes, read the others in the series here , here and here.